Log home chinking solves the issue of sealing any gaps between the logs that allow air infiltration as a result of a log home’s construction. The thick log walls and sealed gaps then offer an energy-efficient thermal mass that rivals any type of construction. Traditional chinking was often made of clay, sand and lime, sometimes mixed with a filler. Now there are high-tech, flexible caulks with excellent properties that act as the chinking between the logs and last longer and perform better than traditional methods. 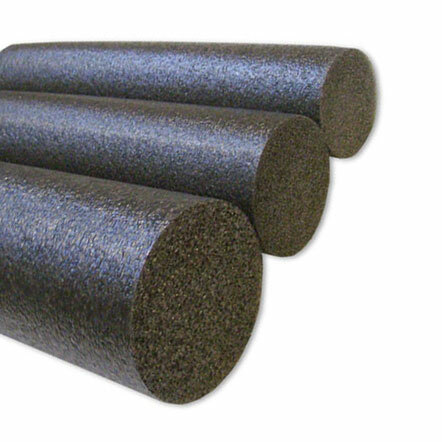 Use of foam backing or backer rod provides the expansion space necessary for a long elastic life. I use the terms “chinking” and “caulking” interchangeably here, but they both refer to the mortar-like material applied between courses of logs in a cabin. Cabins that are deliberately built with spaces between the logs to accommodate chinking are called “chinkers” or chink-style cabins. Good adhesion - meaning that the chinking or caulk sticks to the logs where it’s applied. It must adhere to the logs themselves and not simply fill the gap. Good cohesion - meaning that the chinking or caulk sticks together even under stress. It must be sufficiently elastic to handle the normal expansion and contraction that wood experiences. Log walls are a dynamic structure that expands and contracts with heat, cold and varying moisture conditions. This internal movement means the chinking is stressed and it must be able to flex and not break or split apart. Log home chinking provides a barrier to air and moisture infiltration, as well as keeping bugs out. It is also a log home design feature with your choice of chinking color blending or contrasting with the color of your logs. Depth of the chinking - chinking depth should be no more than ½”; any more than that and it won’t be able to stretch and compress adequately. Points of adhesion - only two points of adhesion is best, since with three points (top log, bottom log, and back of joint) the chinking may be torn apart in multiple directions with the movement of the logs. Use of an expansion space - install a backer rod, basically a foam strip that will fill the space behind the chinking and allow it to expand and contract without forcing it off the wood. Conditions under which chinking is applied - if you apply chinking when it’s hot and humid, the logs will have swelled up to their maximum size, leaving only a small space for the chinking. When the wood contracts it will be stretching the chinking severely. If you can’t avoid the hottest or coldest days, at least try to start with the sunny wall on a cold day, or shaded wall on a sunny day. Also, latex chinking doesn’t like being frozen because it’s water-based (cleanup is normally soap and water). How much chinking will you need? In order to estimate the amount of chinking required you can use the table below. This gives the amount in gallons but you can also buy chinking or caulking by the tube. ½” 1” 1 1/2" 2" 2 1/2" 3"
Tubes of log home chinking or caulking come in 10.5-oz and 29-oz sizes. Since there are 128 ounces in a gallon you can easily convert the amount of chinking needed between gallons and tubes, depending on your preference and ease of application. The low-tech method of applying chinking is to simply spread it on using a putty knife, or to use a grout bag with a nozzle to squeeze it on. But this is only effective for a small area. For larger areas you can buy chinking in 10.5-oz tubes or in the 29-oz tubes and apply it using a caulking gun. 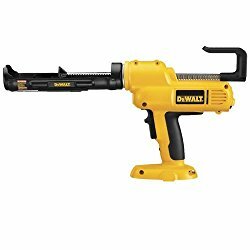 Although the standard manual caulking gun is absolutely fine for small jobs, if you have any sort of large area to cover, I can't recommend an 18-volt battery-powered caulking gun highly enough. Not only will it save you from carpal tunnel pain, it will provide you with a neater, faster job as well. You will quickly recoup the cost with time savings. 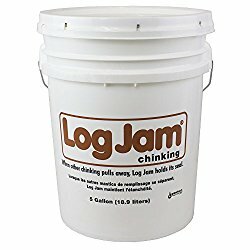 For a large job you can buy 5-gallon buckets of log home chinking and re-load your manual bulk loading gun tubes directly from the bucket. These bulk loading guns also have different nozzle widths to accommodate various chinking widths. Regardless of how you apply the chinking, you will no doubt need to go back over it to smooth it and even it up. The best way is to use a wet foam brush. But since these quickly become smeared with chinking, some people will buy a couple of packs of 25-count foam brushes and keep them in a bucket of water to stay moist. When needed, they use each side of the foam brush one time to brush out a length of chinking, then immediately drop that used brush into another bucket of water and grab a new foam brush from the original bucket. This method gives you clean lines on the chinking. It also helps to keep your tools moist throughout the job to avoid the chinking sticking to the tools. Remember, cleanup is done with soap and water for modern acrylic latex caulking. Be sure and wait for the chinking to thoroughly dry before applying log stain. For maximum effectiveness it’s important to apply log home chinking properly to optimize the thermal mass and beneficial insulating properties of your log walls by utilizing foam backer rod and taking care of the weather conditions when you do the job. You can also make your own cabin chinking. It's a lot of work and you can save money over buying chinking in a tube, but the modern materials used in the prepared tubes is superior in terms of adhesion, cohesion and flex. If you do want to make your own log home chinking, first you need to fill the space between the logs with an insulating material that will flex. A good idea is to use sill seal. This is fiberglass batting or foam gasket in very thin strips, about 5-1/2" wide x 50 ft long, normally used underneath sill boards to seal out air infiltration. Cut this into smaller strips, say about 1" wide and tuck a strip into the space from both sides. Add a string of hot-dipped galvanized finish nails into the lower log at an angle and bend in towards the upper log. This gives the chinking something to lock onto, and when it dries and shrinks, or the logs shrink, you can easily come back later to touch up the gaps. Add enough water (slowly) until the mixture is easy to work but not too wet - about the consistency of peanut butter. Work this into the gaps from each side using a putty knife or drywall knife.